Sohail Engineering Corporation is leading manufacturer of expansion joints and bellows. Thermal growth, cyclic movement, equipment vibrations or pressure pulsation causes a growth in piping system. Now if this growth is not absorbed by the system itself, an expansion joint is a perfect solution to go for. There are three main movements that an expansion joint can take. These are axial, lateral and angulation. 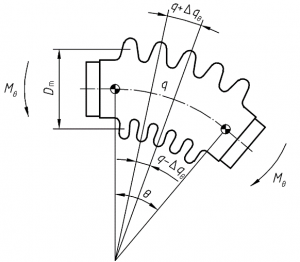 Axial movements is the change in length of bellows in longitudinal direction. These movements can be either compression, extension or a combination of both. Compression is always shows with negative sign (-) and extension with a positive sign (+). The unit of axial spring rate is displayed in N/mm. 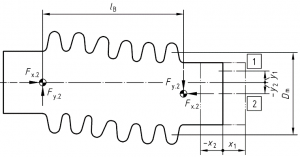 Lateral movement is the displacement of one end of bellows to the other end in a direction perpendicular to horizontal axis. Lateral movement can be absorbed by a single bellow, but the degree of freedom is very small. Hence to achieve greater lateral offset two bellows are joined together with central pipe. This result in greater offset and much lower offset forces. The units of lateral spring rates is displayed in N/mm. 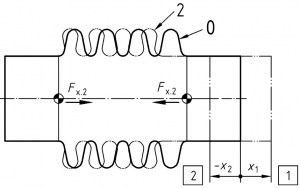 Angulation movement is the rotational displacement of a bellow. The corrugations at the most inner point are in compression whereas those at furthest away are in extension. The angulation of one bellows is often compensated with the second bellow in line. The angulation spring rate of bellow is displayed as Nm/deg.